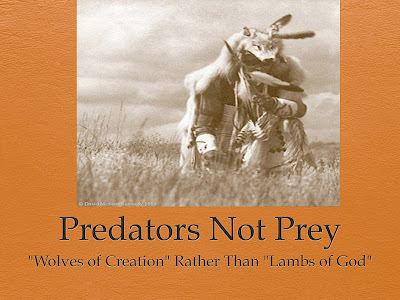 Title Slide: A major difference between Indigenous concepts and those of western culture is the attitude towards predatory species. Indigenous people identify with such entities because they themselves function as predators, often make them clan or totem representatives. In contrast Western popular culture and even large areas of Western Science identifies with prey organisms and codify this in the imagery of their religious traditions. 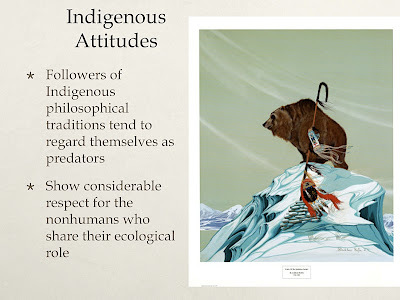 Much of the material for this module is developed from Pierotti (2010) Indigenous Knowledge, Ecology, and Evolutionary Biology, Routledge Press. Slide 2: This attitude on the part of Western people is most apparent in popular entertainment, where humans are always victims and predators are always cast as monsters or villains, even made up monsters like werewolves, vampires, and the Alien, whose biology seems to be based on parasitic wasps that paralyze their prey and the then lay their eggs in the prey so that the offspring have a ready food supply. The image is a poster from Steven Spielberg's film Jaws. Slide 3: Indigenous people identify with and respect predators and assume that the respect is reciprocated. They knew that as hunters they functioned in the ecological role of predators and they knew that it was a difficult thing to take the lives of other beings for food. 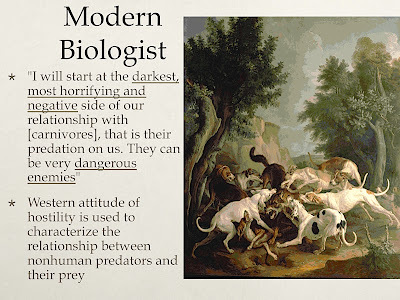 Slide 4: The Western attitude towards predators is even found in some scientists that study predators. 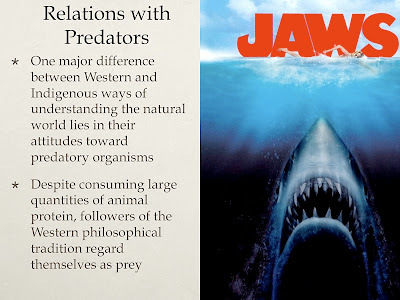 The quote is by Hans Kruuk, who is well known as an investigator of predator behavior, and even though he earns his living studying predators he views them as “enemies”. 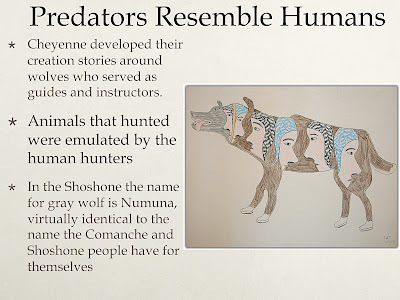 Europeans even turned dogs, which are domestic wolves into beings that attack their ancestors. 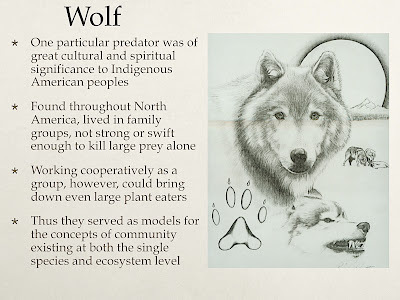 Slide 5: In contrast the Indigenous attitude towards wolves can be seen in this image by an Indigenous artist, Merlin Little thunder. Wolves are guardians and fellow hunters, in fact some investigators have argued that without wolves as companions, modern humans could not have replaced Neanderthals, who did not have wolves as hunting companions. 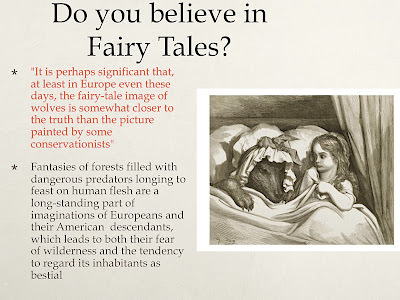 Slide 6: Hans Kruuk even seems to believe in the literal truth of the fable of Little Red-Riding Hood, which is really a story about why young girls should be careful around strange men. This attitude towards predators is extended to wilderness in general, especially towards forests. 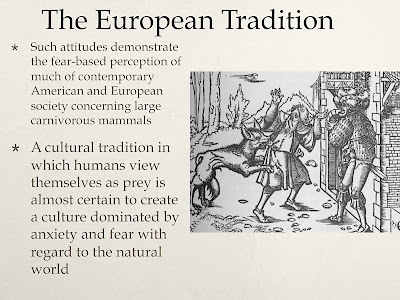 This attitude led Western Europeans to regard residents of Eastern Europe as less than human, which is why vampire and werewolf stories are set in Eastern Europe. Unlike Western Europeans, Eastern Europeans have not destroyed all of their forests. Slide 7: The consequences of such thinking by Europeans are obvious and has created a fearful and anxious people. 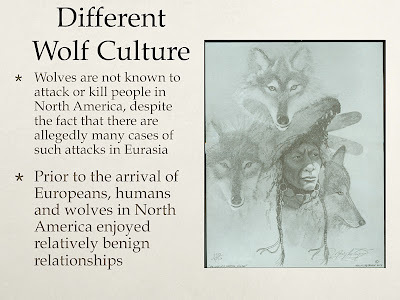 Interestingly, in Europe there are accounts of humans being attacked by wolves, whereas in North America, there are no accounts of wild wolves attacking humans, which may be a consequence of 15,000+ years of acting as each other’s companions. 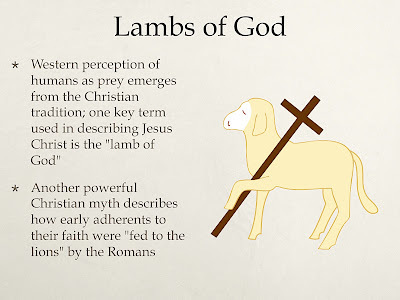 Slide 8: In the Judaeo-Christian tradition the predominant metaphor of humans is of sheep, lambs, or members of a “flock”. Lambs are sacrificed, e.g. in the story of Moses and Abraham. 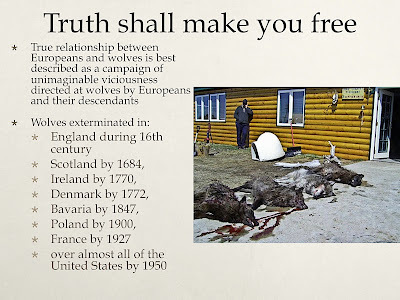 Slide 9: The reality of Europe and America is relentless slaughter directed at wolves by people of European ancestry. For some reason special hatred is directed at wolves by Europeans. Source: McIntyre, R. 1995. War against the wolf: America's campaign to exterminate the wolf. Stillwater MN: Voyageur Press. Coleman, J. T. 2004. Vicious: Wolves and men in America. New Haven CT: Yale University Press. 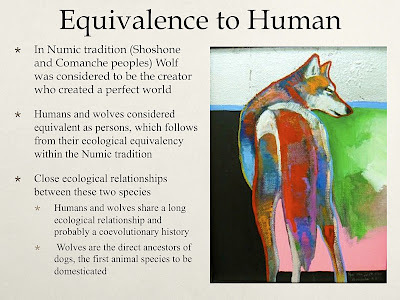 Slide 10: In Indigenous traditions wolves and bears are two of the most honored and respected species, and humans used both as models of how to behave. Wolves were admired for their cooperative hunting abilities, especially by Plains Tribes. Slide 11: In hunting societies people spend much of their time thinking about animals and how to supply their families with food. In this image the thought patterns of a human hunter are illustrated and it is clear that the animals and humans are considered to be equals. Image: Simon Tookoome (Baker Lake) I am always thinking about the animals. 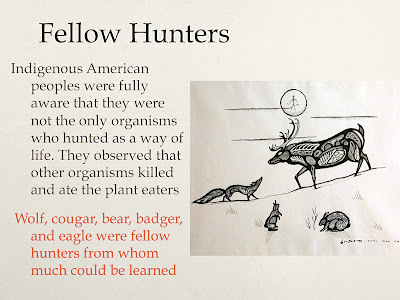 Slide 12: To be a good hunter meant that you knew the animals and their habits, and how they interacted with their environment. The anthropologist Paul Nadasdy describes the ability of an Old Kluane hunter named Moose Jackson. “Moose said he can tell by looking at moose tracks how old they are…where the sun was at the time the moose was there and the direction the wind was blowing. This information, combined with his knowledge of moose behavior, is enough for him to know where the moose was going and what it was doing…This information is enough to tell him where the moose is…he does not actually have to follow the moose tracks, he merely goes to where he knows the moose will be” (Nadasdy 2003, Hunters and Bureaucrats, UBC Press, 107, emphasis added). The image shows an Antelope Surround, which is a tactic used by Plains people to take advantage of the curiosity of Pronghorn, who are very hard to hunt as individuals since they are the fastest animal in North America. 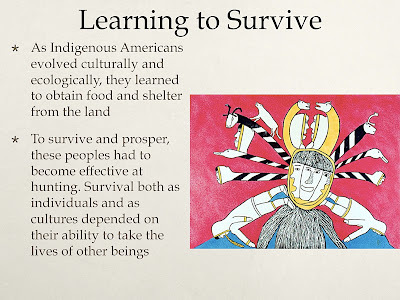 Slide 13: As we discuss in the module on Community, Indigenous stories function to provide important instruction in both life skills and ethical treatment of others. This is especially true of stories about hunting, where ethical considerations are especially important because hunting deals with life and death. 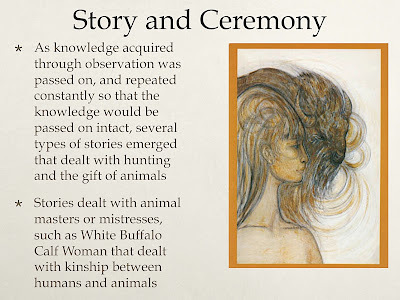 A classic story in this vein is the Story of White Buffalo Calf Woman, which is a story shared by many plains peoples. 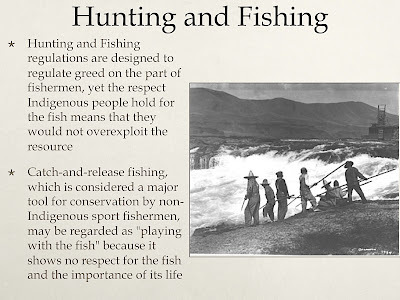 Slide 14: The ethical issue in hunting is well expressed in this quote from a Canadian Inuit hunter Ivaluardjuk, cited in Rasmussen 1929. The intellectual culture of the Iglulik Eskimos. Vol. 7 of Report of the Fifth Thule Expedition, 1921-1924. Gyldendalske Boghandel, Copenhagen. 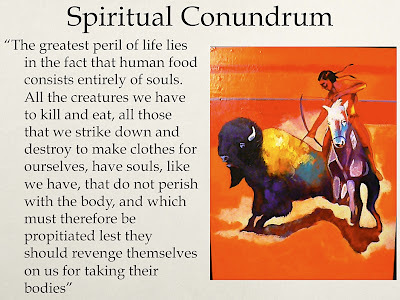 The ethical conundrum over taking lives to eat meat can provide an excellent topic for discussion in students of any cultural background, but the Indigenous perspective is powerful because it acknowledges the existence of spirit or soul in nonhumans, which sets it up in opposition to Western Cartesian based thinking, where it is argued that humans have souls, but nonhumans do not. 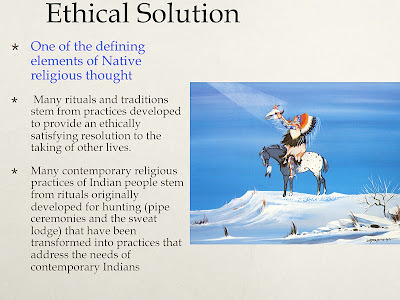 Slide 15: As was stressed in the module on community, the solution derived by virtually all indigenous societies and cultures was to develop rituals and ceremonies that honored the sacrifice made by prey animals and established that proper thanks must be given to the animal for giving its life and that its remains must be handled with great respect. Harrod, H. I. 2000. The animals came dancing: Native American sacred ecology and animal kinship. Tucson: University of Arizona Press. Image is Giving Thanks by the Comanche artist Doc “Tate” Nevaquaya. 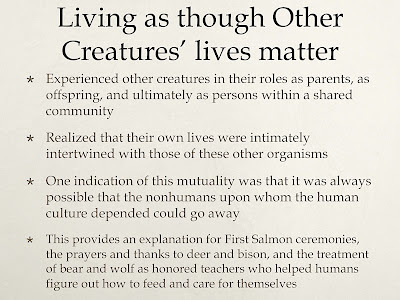 Slide 16: Recognizing the ethical issue behind taking lives for food, increased the respect that was given to nonhuman predatory species, like wolf and bear. 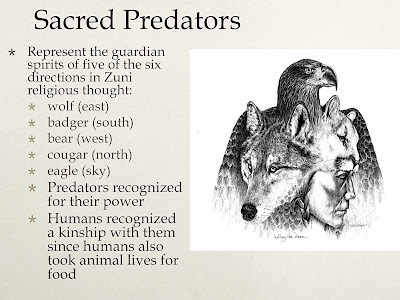 Slide 17: These links to predators are found in almost all North American Indigenous traditions, such as in pueblo people where predators are guardians off all 6 major directions. The 6th direction, earth, has Mole as a guardian spirit, and although moles are not large predators, they are the top predator that lives in the earth. The 7th and final direction is inside the human body, which shows the link between humans and predators in obvious spiritual terms. Harrod, H. I. 2000. The animals came dancing: Native American sacred ecology and animal kinship. Tucson: University of Arizona Press. Henriksen, G. 2009. I Dreamed the Animals: Kaniuekutat, The Life of an Innu Hunter. Berghahn Books, NY, NY. Marshall-Thomas, E. 1994. The tribe of tiger: Cats and their culture. New York: Simon and Schuster. Marshall, J., III. 1995. On behalf of the wolf and the first peoples. Santa Fe NM: Red Crane Books. Tanner, A. 1979. Bringing home animals. London: C. Hurst. The image is by Inuit artist Simon Tookoome, called Animals and shows the links between predator (wolf), prey (muskox) and humans. 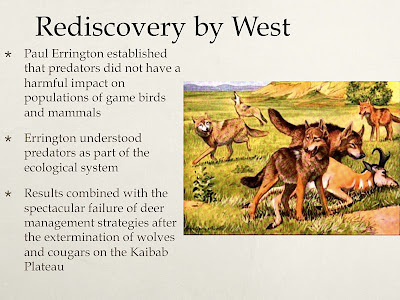 Slide 19: It was not until the work of Paul Errington, a graduate student of Aldo Leopold that Western science and ecology began to realize that predators are an important part of any ecosystem and are not simply destructive rivals of humans. Errington grew up in South Dakota, running trap lines with his Lakota neighbors, so it is very likely that this influenced his thinking and research. To look at Errington’s work read any of the following papers or books. Errington, P. 1934. Vulnerability of bob-white populations to predation. Ecology 15: 110-127. Errington, P. . 1937. What is the meaning of predation? In Annual Report of the Smithsonian Institution for 1936, 243-252. Washington, DC: Government Printing Office. Errington, P. 1967. Of predation and life. Ames: Iowa State University Press. Errington, P. 1973. The red god’s call. Ames: Iowa State University Press. Slide 20: Wolves were of special importance to North American tribes, especially those that lived on the plains and hunted on foot. For an excellent example of this read the title essay In Joseph Marshall’s 1995. On behalf of the wolf and the first peoples. 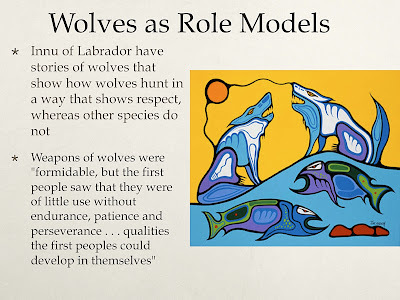 Slide 21: Many hunting peoples view wolves as their models for a wide variety of reasons, but in all cases wolves were treated with respect. Quote is from: Marshall, J., III. 1995. On behalf of the wolf and the first peoples. Santa Fe NM: Red Crane Books. 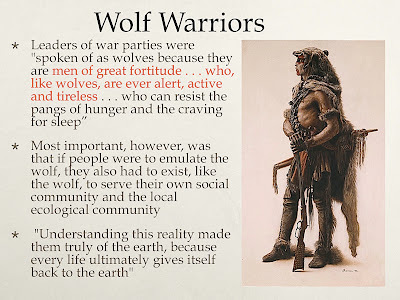 Slide 22: The greatest warriors were specifically identified with wolves, which indicates how a positive image of wolves might spread through a culture. Quotes from: Joseph Marshall III. 1995. On Behalf of the Wolf and the First peoples. Red Crane Press. 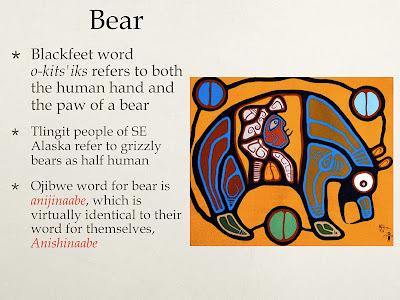 Slide 23: Along with Wolf Bear was an important teacher and spiritual guide, especially mother bears that were viewed as exemplary parents. This was especially true of the Anishinaabe (Ojibway, Chippewa) people. Slide 24: Bears were especially important in identifying plants that could be used as food, because if a bear could eat it so could a human. 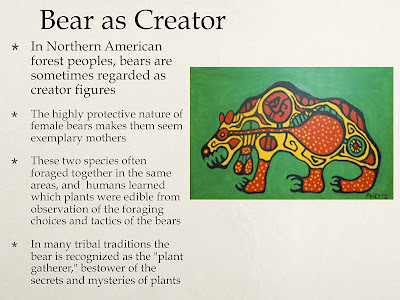 This is probably a very ancient story and shows that these ancient people recognized that like humans bears eat both meat and plants so their digestive capabilities must be very similar to ours. Image by Anishinaabe artist Payette. 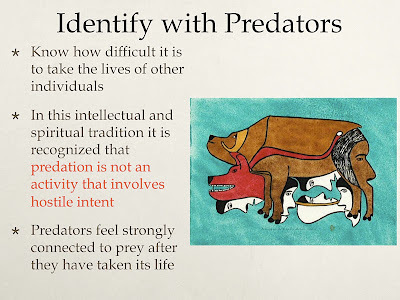 Slide 25: Most creator figures in Indigenous traditions are predators as are most clan moieties. 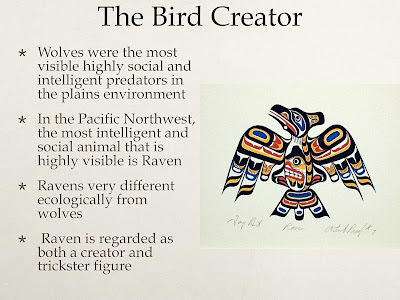 For example in the Pacific Northwest the four common clans are Eagle, Killer Whale (Orca), Wolf, and Bear. In each case this represents a powerful and effective predator from four important environments: air (eagle), water (orca), Open country (wolf), and forest (bear). In addition, like humans all four of these species eat salmon. 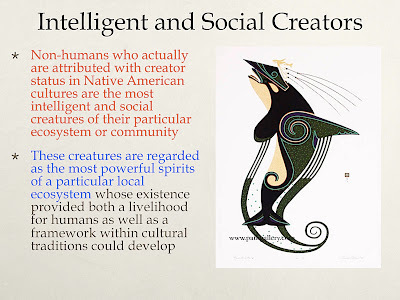 Slide 26: These creator figures were assumed to be older than humans, but clearly equivalent to them or perhaps greater in power. 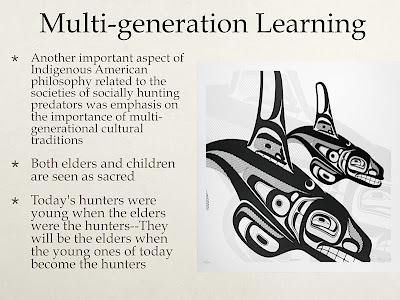 Slide 28: The issue of intergenerational learning implies cultural traditions in non-humans and as a result it is still not widely recognized in nonhumans. For a good discussion of culture in nonhumans read Franz deWaal’s 2001 book, The Ape and the Sushi Master. 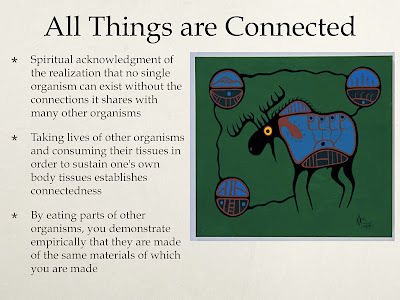 Slide 29: The idea of connection among life forms, which is also discussed in the module on Community, is emphasized by predation and eating, in which it is established that you are made up of the same material as all other life forms. 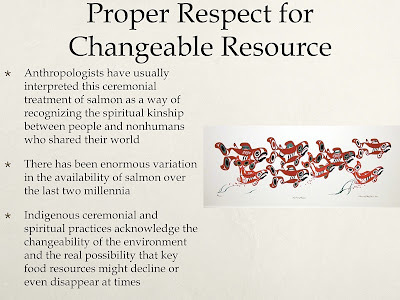 Slide 31: Respect for the sacrifice made by a potential food animal means that Indigenous peoples resist some Western management practices aimed at conservation, such as catch and release, or mark recapture. It can lead to an interesting discussion in class to address this issue and the attitudes of students from different cultural traditions. Source: Pierotti, R. and D. Wildcat. 1999. 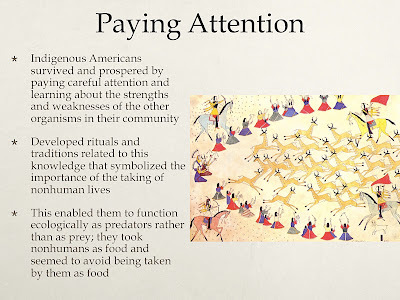 Connectedness of Predators and Prey: Native Americans and fisheries management. Fisheries (J. Amer. Fisheries Soc.) 24 (4): 22-23. 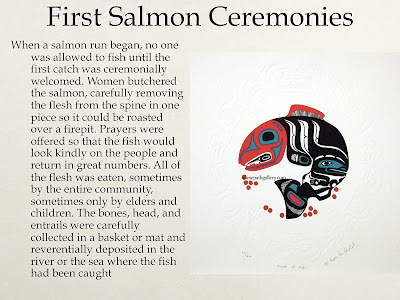 Slide 32: In a First Salmon Ceremony, the fish was bathed, painted with red ochre, and sprinkled with bird down. The fish was ceremonially carried to the place where it would be prepared, laid on a bed of ferns, and dabbed again with ochre. Slide 33: Recent studies that analyze bottom sediment from coastal waters of British Columbia and southeast Alaska have shown that far from being consistently predictable, there has been enormous variation in the availability of salmon over the last two millennia (Jonathon Raban 1999, Passage to Juneau: a sea and its meaning,, 400). Year-to-year fluctuations in salmon runs typically show relatively little variation, but over twenty- to thirty-year periods the availability of salmon approximates a wavelike pattern during which salmon populations peaked, declined, remained in a trough for several years, came back, and then diminished again after crests that lasted five to ten years (Raban 1999). In the early sixteenth century there were big runs, followed by a steady fall to the middle of that century. In the early eighteenth century populations were low, but they recovered near the end of that century so that when Europeans arrived there appeared to be a time of abundance for salmon, which the Europeans apparently assumed was the normal state. There was another peak in the late nineteenth century that seems to coincide with the beginning of commercial salmon fishing. Starting in the 1950s until the present there has been a consistent low in salmon numbers, which corresponds with a decline in the salmon fishery (Raban 1999). 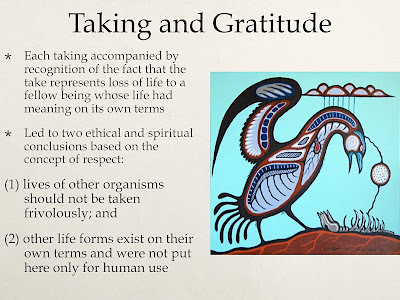 Slide 34: The most important message of Indigenous thinking towards nature can be summed up in this way.